Nawa Fender Baskets are extremely easy to fit using just a flat head screwdriver. Mrs. Compass claims that it is so easy even a man can do it! Step 1 - Make sure you have the right equipment! Check that the size of basket is right for your fender and that the swivel connectors are the right size for the rail (measure the full diameter of the rail and stanchions in millimetres). The Swivel connectors connect the baskets to the rail and range from a standard 22mm to 32mm. 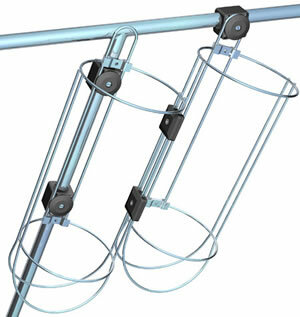 You will need 1 pair of parallel connectors for each pair of baskets you are going to attach. You will also need a flat head screwdriver. Step 2 - Get your rails ready to attach the baskets - The swivel connectors will be used to attach your baskets to the rails so next you need to fix the square part of the swivel connectors (loosely, to allow you to move them where necessary) to the rails and stanchions ready to fix the baskets. Step 3 - Attach your baskets to each other - The next step is to connect your baskets to one another with your parallel connectors. The connectors have grooves to accomodate the bars of the baskets so simply screw them together tightly. You nowhave a pair (or more) of baskets ready to mount. Step 4 - Mount your Nawa Fender Baskets - Ensure the strut at the side of the fender basket is pointing rounded end towards the opening of the basket and attach it with the screws to the basket. Then using the disc part of the swivel connector attach the assembled baskets to the already mounted swivel connectors. These can be moved and then tightened when in the perfect position!